The translation of knowledge, opinion and understanding into a written response can be a challenge for a number of students. Teachers across content areas often discuss the challenge of not only improving the quality of student writing, but also having it be a reflection of what students know. The typical protocols for developing written voice involve a variety of strategies and resources including pre and post writing strategies. Graphic organizers, journaling, conferencing, word webbing and collaborative authoring and review through online documents are just a few of the strategies employed. Typically students are presented with a prompt and asked to formulate a written response that includes supporting evidence. The guiding words used in such prompts are typically who, what, when, where, why and how. 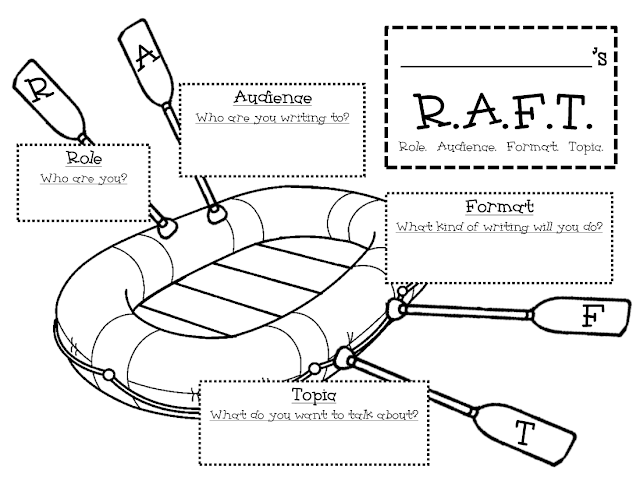 RAFT writing takes a more holistic approach to the process, but segments the objective into four components that students can easily understand. It also provides an authentic and engaging connection to the content. The flexibility, choice and alternative formats offered with this strategy offer differentiation and authenticity to the task at hand. The final product presents a higher order understanding of the content presented. I recently observed a U.S. history course in which the students were being introduced the the viewpoints of the Federalists and the Anti-Federalists with regards to the ratification of the Constitution. A simplified explanation of the objective was for students to understand the supportive and opposing views of establishing and investing in "big government"
Topic - Your concern regarding the proposal to unite all of the schools in Morris County, NJ into a single school district. The infusion of a RAFT writing task may be utilized to introduce a topic or as a formative or summative assessment. There are a variety of resources available including online random generators. I have curated many of them within the Wiki linked below.